At Loudon Park Cemetery, we offer many types of unique and personalized options to commemorate the lives of loved ones and to help ensure that legacies will endure for generations to come. Whether your preference is in-ground interment, mausoleum entombment or a memorial choice specific to cremation, we have selections ranging in price and style to accommodate your needs. The following will provide you with an overview of different types of cemetery memorialization. For more information on the beautiful and unique options at Loudon Park Cemetery, call us today. Our counselors will be happy to provide details or to answer any questions you may have. Aboveground structures are an alternative to traditional ground burial. Multiple options and price ranges allow families many choices. Aboveground entombment also helps to eliminate expenses for some burial items such as an outer burial container. Private mausoleums are lasting structures used for the entombment of family or group members. They can accommodate a variety of individual preferences including casketed burial and cremation urn interment. Private mausoleums are beautifully designed to reflect a family's unique heritage and create a permanent tribute to lives well-lived. Family tombs are a popular choice for private and peaceful aboveground entombment. 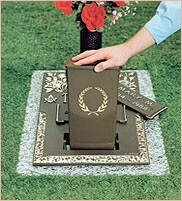 These crypts come in a variety of designs, materials and arrangements. 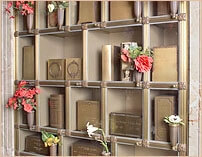 Single- to six-crypt (or larger) preassembled private mausoleums are available for placement on your own cemetery site. Community mausoleums offer the dignity, permanence and beauty of aboveground burial. These structures offer entombment for many, housing individual and companion crypts and often cremation niches as well. Chapel mausoleums house a chapel in which indoor services can take place. A chapel mausoleum is another elegant, yet affordable, option for families considering this form of entombment. 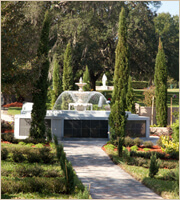 Garden mausoleums are open-air structures that provide a lasting and beautiful remembrance option. Special landscaping features and outdoor environment make this a desirable choice for many people. In-ground burial provides a wide variety of choices, and it allows for personal preference by offering individual, companion or family locations within beautifully manicured gardens and special areas. Costs are flexible and there are prefunded plans to meet most any budget. There are many personalization and memorialization selections available, allowing families to personalize loved ones' gravesites through a range of memorial options. In-ground burial often requires an outer burial container. Family estate sections allow family members to be together in a shared area, often bordered by special landscaping or architectural elements. Cremated remains can also be interred here. Family estates are a wonderful way to preserve family heritage and maintain a historical resting place for future generations. 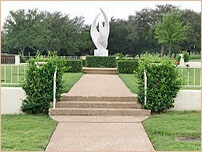 Upright memorials have long been considered a prestigious and personal form of memorialization and are a popular choice for many individuals choosing in-ground burial. These memorials come in many different materials and sizes and can be as simple or elaborate as you choose. Lawn crypts are preconstructed cemetery burial spaces that contain a vault that shelters a casket. Lawn crypt gardens are considered by many to be an economical and effective use of land, and with multiple installations of crypts, families have an affordable alternative for a full casket burial or cremation. Each lawn crypt is reinforced with lasting materials that provide durability and stability. Elevated lawn crypt gardens are specially appointed gardens that are slightly raised from ground level. These gardens blend beauty with convenience and offer a cost-efficient alternative to traditional ground burial. Cremation is often chosen and widely accepted within many religions. When we are cremated, we are reduced to our natural elements, quickly and without chemicals. 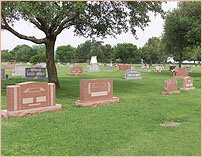 A variety of disposition options is available for those who choose cremation, including private family estates, columbaria, special garden areas, ground burial, cremation benches and pedestals, urns, cremation niches and more. Cremation also relieves stressful time factors, since the process allows gathering and services to be held at any time. 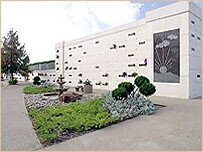 A cremation garden is an area designed especially to protect and memorialize cremated remains. The garden can be a simple area or a more elaborate landscape that features a variety of cremation memorial options, including many of those listed below. A private family area or structure is an option whether you choose cremation or burial. Family niche units allow family members to be together in a shared area, often bordered by special landscaping or architectural elements. 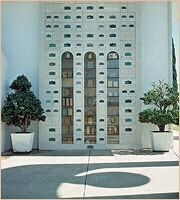 A family mausoleum can accommodate both cremation urns and casketed entombment. 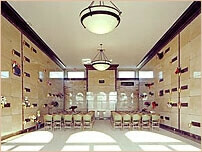 A columbarium is a specially designed structure comprising multiple cremation niches (small compartments) that hold cremated remains sheltered in an urn. A columbarium may be an entire building, part of another structure or situated in an outdoor setting such as a cremation garden area. Glass-front niches offer a unique and tasteful way to pay special tribute and preserve precious memories. The clear-glass facing allows visitors to view special keepsakes, photos and personal memorabilia in remembrance of a loved one. 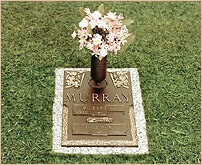 Bronze memorials are designed especially for families or individuals who choose cremation and prefer ground burial. An urn fits directly into the tamperproof bronze memorial. Companion ground-burial options are available even when one spouse chooses traditional burial and the other, cremation. Cremation benches and pedestals provide a desirable alternative for sheltering cremated remains in a peaceful outdoor setting. There are many designs that represent a personal way to commemorate the life of a loved one.